Tickets may now be purchased for the 2016 Texas Craft Brewers Festival. 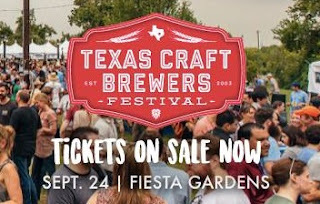 Put on by the Texas Craft Brewers Guild, the festival which represents the largest event in the state focused exclusively on Texas-brewed beer will be held on September 24, 2016, at Fiesta Gardens in East Austin. "Once again we are excited to bring Texas craft brewers and Texas craft beer fans together in Austin for our unique celebration," said Charles Vallhonrat, the Guild's executive director. "The Texas Craft Brewers Festival is one of a kind because it really is the brewers' festival. With nearly 200 operating and in-planning brewery members, the Texas Craft Brewers Guild is the leading advocate for Texas craft beer, and we are excited to have our members come together with the people who love craft beer for this great celebration." Tickets prices for the Texas Craft Brewers Festival range from $30 for general admission (early bird rate valid up until July 15, 2016) to $75 for VIP privileges. Complete details on ticketing options, including information on discounted passes for designated drivers, can be found on Eventbrite.